These are rare Mexican sticker trading stamps from the Irwin Allen Time Tunnel TV series. The cards were made in the late 1969-70's and were very limited. It is unknown how many stamps completed the set, and if a booklet was also made for the collection. Pictures featured here is Robert Colbert from his early days on the classic Western drama, Maverick. 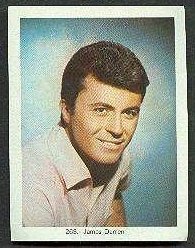 Also shown is actor James Darren in a early promotional shot.